In 2007-8 further follow-up work was carried out, comprising a contribution to a major publication, geophysical survey of crop marks of defended enclosures on the Llŷn Peninsula and education and outreach work in the Conwy County area. The publication work was a contribution to a Pan-Wales monograph synthesising the work that had been carried out for Cadw by all the Welsh Archaeological Trusts. The contribution from Gwynedd concentrated on the relationship between hillforts and settlement with reference to the particularly good surviving evidence for settlement and associated field systems in North-West Wales. It considered the types of hillfort, their probable chronology and the types of settlement and field systems. It provided some new insights into the origin and function of field systems and considered how these related to the function of the forts where the economy might be dominated by arable or stock farming or a mixture of the two. It also considered the relationship between hillforts and settlement remains in the upland. The dominance of the uplands amongst the known remains of settlement makes the use of the uplands a central part of the study, but including comparisons with the lowland from where much of the excavated evidence is available. The chapter drew together the strands of knowledge with a view of chronology and function of forts with their possible meaning in terms of social and political structure and relevance to the changes that took place during and after the period of Roman control. Shorter case studies were produced to create stand alone box features. First, a study of the ‘lost’ hillfort of Braich y Dinas, Penmaenmawr, once regarded as the best preserved hillfort in Wales, but destroyed by quarrying in the early 20th century. The second was a study of the well-known stone-built hillfort of Tre’r Ceiri. The third was a study of the hillfort of Castell Odo, Llŷn Peninsula, a type site for a group of early concentric hill-top defended enclosures in this area. The final feature item was produced by Peter Crew, then of the Snowdonia National Park, and provided an overview of iron working evidence from Bryn y Castell hillfort, Meirionnydd. The draft chapter included a selection of proposed illustrations including distribution maps, site plans, aerial photographs and diagrams which will be adjusted to fit in with the overall style and content of the volume. 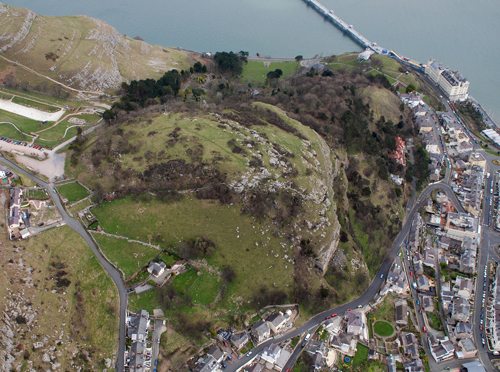 Pen-y-dinas, Llandudno is of interest for its proximity to the Bronze Age copper mines. One 19th century excavation indicated occupation during the Roman period. Another excavation in the mid 20th century produced an assemblage of butchered animal bones, a unique find in relation to hillforts in north-west W ales, but had not been published. Part of the present project included study and dating of these finds, housed in Llandudno Museum. These finds are currently being studied by a specialist prior to radiocarbon dating, which it is hoped will throw more light on the occupation of the fort.